You the consumer have a right to choose who repairs your vehicle! At Stephen’s Auto Body our staff has years of knowledge and tools needed to work on all makes and models of vehicles. This allows us to restore your vehicle back to its pre accident condition in a timely manor. 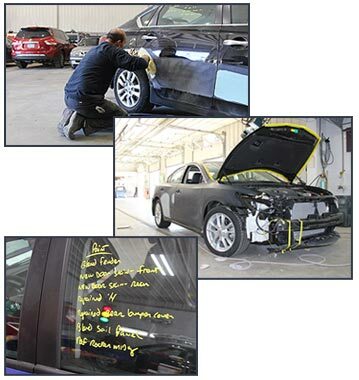 Our collision center located on 140 Tremont St. Melrose is equipped with tools that allow us to fix vehicles involved in both major and minor collisions, like the typical “fender bender.” Our frame machines are available to correct both unibody and full frame damages. Prospot resistance welders achieve factory style welds to ensure seamless repairs. We also have our own lifts, wheel balancing and alignment equipment enabling us to provide in house mechanical work. As an added service we fully clean vehicle before you come to pick it up. In our paint area, we have two state-of-the-art Garmat down draft spray booths, which are designed to minimize dust and defects, ensuring a near factory finish. We utilize eco-friendly PPG waterborne paints. Our computerized mixing station maximizes our ability match each manufacturer’s specific color code.